Central Catalan (Catalan: català central; pronounced [kətəˈla sənˈtɾal]) is the Eastern Catalan dialect with the highest number of speakers, since it is commonly spoken in densely populated areas such as the whole Barcelona province, the eastern half of Tarragona province and most of the Girona province, except for it is northern part, where a transition to Northern Catalan begins. This variety (when free of localisms from Barcelona, Tarragona or Girona) is perceived by most Catalans as the standard form in Catalonia. As such, it is the variety used in most written and audiovisual media, as well as in learning materials. In Empordà region of Catalonia we could also distinguish an Empordanese subdialect. As evidenced in writings from the turn of the 19th century, by authors such as Joaquim Ruyra, differences with Barcelonese dialect were higher formerly than nowadays, for instance, regarding the usage of salat article. In the books of Ruyra there are signs of a clear state of diglossia: the more cultured figures, including the narrator, use the standard Barcelona dialect, whilst the local fishermen employ their own dialect. Mon, ton, son etc. for el meu, el teu, el seu (etc. (mine, yours, his) - these variations are not only restricted to the Empordanese Catalan, but are also in use, albeit not often, in Central Catalan; and are generally understood by all Central Catalan speakers. An inversion of the personal pronouns: me, te, se instead of em, et, es (me, you, him). The use of a 3rd person subjunctive ending in u instead of i: llamp me matu for llamp em mati (strike me down, lit. lightning kill me). Sebre for saber (to know) with irregular past participle (sapigut for sabut, known). 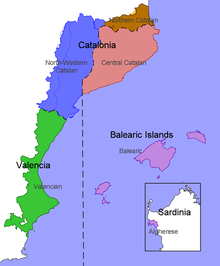 The Christian colonization of the Balearics was primarily done with settlers from this region and so both dialects share several similarities, most obviously the now practically extinct use of the salat article. In addition, some synonyms are used more predominantly, for example capir, capieixo, for entendre, entenc (to understand, I understand) and testa for cap (head) which share a closer similarity to modern Italian (capire, capisco / testa) than Standard Catalan. Un home només tenia dos fills. El més jove va dir al seu pare: «Ja és hora que sigui el meu propi amo i que tingui cèntims; me n'he [me n'haig] d'anar a veure món. Partiu la vostra herència i doneu-me el que em toqui». «Ai, fill meu», va dir el pare, «com vulguis; ets un dolent i Déu et castigarà». I després va obrir un calaix, va partir la seva herència i va fer-ne [en va fer] dues parts. Al cap d'uns quants dies, el dolent se'n va anar del poble molt tibat i sense dir adéu a ningú. Va travessar molta terra ferma, molts boscs i molts rius, i va arribar a una gran ciutat on [a on] va gastar tots els cèntims. There once was a man with two sons. The younger said to his father: "Now it's time that I follow my own master and that I have money: I have to go out and see the world. Divide your goods and give me that which is my share." "Oh, my son," said his father, "as you wish, you are a bad man and God will punish you." And afterwards he opened a small box, and divided everything he had into two parts. Some days later, the bad young man went away from the village very proudly and without saying goodbye to anyone. He travelled through many desolate lands, many woods and many rivers, and he arrived at a big city where he spent all his money. This page was last edited on 11 October 2018, at 13:55 (UTC).